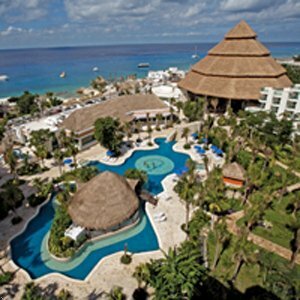 Park Royal Cozumel is the most spectacular ALL INCLUSIVE Resort in the island. The New Park Royal Cozumel offer 348 elegant and spacious Deluxe Rooms and Suites, Provided with private balconies and the majority of them will enjoy breathtaking ocean views. Location is all at Park Royal Cozumel. Along with its spectacular settings in front of Paradise Reef and Paradise Wall, a very well known area in the island for being a premier snorkeling and diving spot and for its peaceful and transparent waters, Park Royal Cozumel is at the same time within walking distance to main shopping and Entertainment Centers and only 7 minutes away from San Miguel de Cozumel Downtown. While Enjoying the breeze in their private balconies, our Guests will be delighted to watch the spectacular Cruise Ships arrivals at Puerta Maya International Pier, situated across Park Royal Cozumel. DELUXE ROOMS WITH MARBLE FLOORS, ALL ROOMS ARE PROVIDED WITH PRIVATE BALCONIES, OCEAN AND GARDEN VIEWS, TWO DOUBLE BEDS OR ONE KING SIZE BED, 29" WIDTH TVÂ´S SCREEN WITH CONTROL AND CABLE, AIR CONDITIONING, TELEPHONE, SAFETY DEPOSIT BOX IN THE ROOM, BATHROOMS WITH HAIRDRYER, VANITY MIRRORS AND SHOWER WITH GLASS DOOR. RESTAURANT WITH AIR CONDITIONING AND MEXICAN ATMOSPHERE, SITUATED NEAR CHAC MOOL BAR. Type of Food Served: MEXICAN CUISINE - A LA CARTE RESTAURANT Neither children under 12 years old nor groups are allowed in El Mexicano. DRESS CODE: LONG PANTS, SLEEVED SHIRTS, AND CLOSED-TOE SHOES FOR MEN; AND NO SHORTS OR BEACH SANDALS FOR WOMEN. RESTAURANT WITH AIR CONDITIONING AND ITALIAN ATMOSPHERE, SITUATED NEXT TO EL MEXICANO RESTAURANT. Type of Food Served: ITALIAN CUISINE - A LA CARTE RESTAURANT Neither children under 12 years old nor groups are allowed in El Italiano. DRESS CODE: LONG PANTS, SLEEVED SHIRTS, AND CLOSED-TOE SHOES FOR MEN; AND NO SHORTS OR BEACH SANDALS FOR WOMEN. RESTAURANT DECORATED WITH CARIBBEAN ATMOSPHERE, SITUATED NEAR THE INFINITY POOL LEFT SIDE. Type of Food Served: CARIBBEAN & CREOLE CUISINE - A LA CARTE RESTAURANT DRESS CODE: LONG PANTS, SLEEVED SHIRTS, AND CLOSED-TOE SHOES FOR MEN; AND NO SHORTS OR BEACH SANDALS FOR WOMEN.